Dr Hasson will be providing free hair transplant consultations in London on Sunday 9th to Tuesday the 11th of November. The consultations will be held at the Thistle Hotel in Marble Arch and are strictly by appointment. Previous patients of Dr Hasson are very welcome. 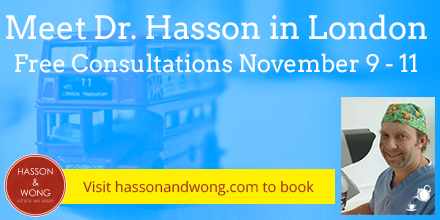 To arrange an appointment contact myself on david@hassonandwong.com or phone 0757 8164162 for more details.